You gotta work hard for the money. 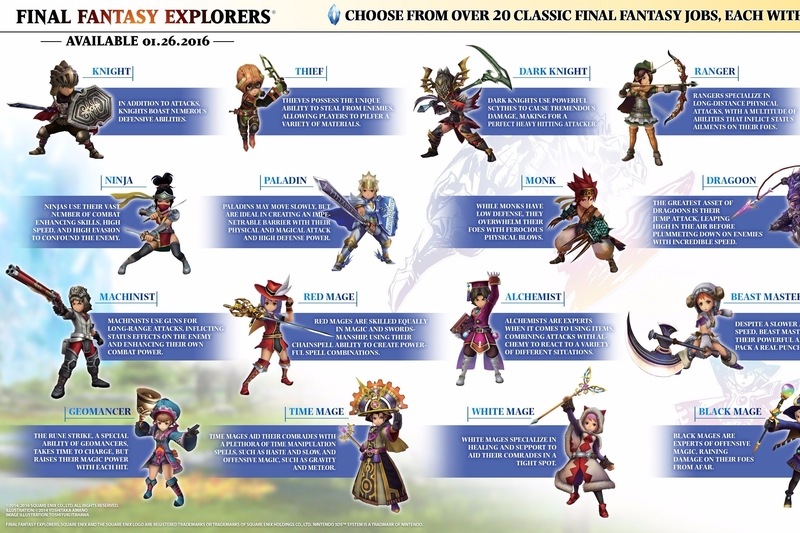 Final Fantasy Explorers is coming soon, and Square Enix has finally revealed every job you'll be able to have in the game. Knight - In addition to attacks, Knights boast numerous defensive abilities. Thief - Thieves possess the unique ability to steal from enemies, allowing players to pilfer a variety of materials. Dark Knight - Dark Knights use powerful scythes to cause tremendous damage, making for a perfect violent hitting attacker. Ranger - Rangers specialize in long-distance physical attacks with a multitude of abilities that inflict status ailments on their foes. Bard - Bards enhance their comrades' abilities from the rear ranks by playing individual songs using their instruments as weapons. Samurai - As an all-range attacker, Samurai wields katana and have an exceptionally high damage output. Ninja - Ninjas use their vast number of combat-enhancing skills, high speed, and high evasion to confound the enemy. Paladin - Paladins may move slowly, but are ideal for creating an impenetrable barrier with their physical and magical attack, and high defense power. Monk - While Monks have poor defense, they overwhelm their foes with ferocious physical blows. Dragoon - The greatest asset of Dragoons is their Jump attack, leaping high into the air before plummeting down on enemies with incredible speed. Sage - Sages have the greatest magical attack and healing power, and can use their Concentrate ability to enhance their skills. Machinist - Machinists use guns for long-range attacks, inflicting status effects on the enemy and increasing their combat power. Red Mage - Red Mages are skilled equally in magic and swordsmanship, using their Chainspell ability to create powerful spell combinations. Alchemist - Alchemists are experts when it comes to using items combining attacks with alchemy to react to a variety of different situations. Beast Master - Despite a slower attack speed, Beast Masters user their mighty ax to pack a real punch. Freelancer - Freelancers are not particularly gifted in one field, but have considerable freedom in abilities and gear they can equip. Geomancer - The Rune Strike, a unique ability of Geomancers, takes some time to charge. But raises their magic power with each hit. Time Mage - Time Mages aid their comrades with a plethora of time manipulation spells, such as Haste and Slow, and offensive magic, such as Gravity and Meteor. White Mage - White Mages specialize in healing and support to aid their comrades in a tight spot. Black Mage - Black Mages are experts of offensive magic, raining damage on their foes from afar. Blue Mage - Blue Mages have a unique ability to learn and master techniques used by the enemy, allowing them to fulfill many different roles. Final Fantasy Explorers comes to the United States on January 26 exclusively for the Nintendo 3DS.